VietPress USA (Jan. 1st, 2017): On Dec. 4th, 2017, President Donald Trump signed an official declaration to recognize Jerusalem as the Capital of Israel and orders to move US Embassy from Tel Aviv to Jerusalem. This has caused so many problems and struggles against Israel by Palestinian protesters. 22 of 28 members of EU rejected Trump's recognition of Jerusalem as capital of Israel. On Dec. 21, 2017, UN voted with 128 approved the UN Resolution to reject Trump's declaration on Jerusalem, On Dec. 25, 2017, Trump's administration announced to cut off USD 285 Million funding to UN. 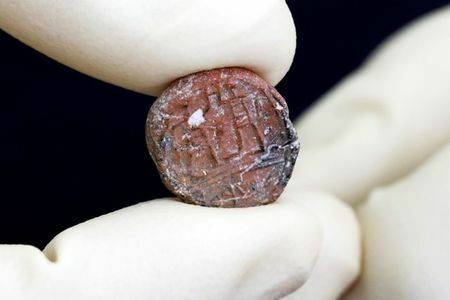 Today, the archaeologists from Israel Antiquities Authority said that they just found out a 2,700 year-old clay Seal belonged to a biblical Governor of Jerusalem. This Seal was unearthed in excavations in the Western Wall plaza in Jerusalem's Old City. JERUSALEM (Reuters) - Israeli archaeologists unveiled on Monday a 2,700-year-old clay seal impression which they said belonged to a biblical governor of Jerusalem. The artifact, inscribed in an ancient Hebrew script as "belonging to the governor of the city", was likely attached to a shipment or sent as a souvenir on behalf of the governor, the most prominent local position held in Jerusalem at the time, the Israel Antiquities Authority said. The impression, the size of a small coin, depicts two standing men, facing each other in a mirror-like manner and wearing striped garments reaching down to their knees. It was unearthed near the plaza of Judaism's Western Wall in the Old City of Jerusalem. "It supports the Biblical rendering of the existence of a governor of the city in Jerusalem 2,700 years ago," an Antiquities Authority statement quoted excavator Shlomit Weksler-Bdolah as saying. Governors of Jerusalem, appointed by the king, are mentioned twice in the Bible, in 2 Kings, which refers to Joshua holding the position, and in 2 Chronicles, which mentions Masseiah in the post during the reign of Josiah. The Antiquities Authority's announcement came several weeks after U.S. President Donald Trump recognized Jerusalem as Israel's capital, a decision that overturned a decades-old policy on the status of the city and stirred Palestinian protests and international concern.